There are no prizes for coming second in an election. Here are 9 factors that will determine India’s next Prime Minister. There are no prizes for coming second in an election. All you get is five years to introspect what you did wrong. Being out of power can be really depressing, especially once you have tasted it. Elections thus are the most innovative form of business, politicians are the smartest entrepreneurs. The Prime Minister’s post is the ultimate trophy in this winner-take-all contest. They have every incentive to try all sorts of innovations, tricks and games to win and be No. 1. There are 9 factors – 3 sets of numbers, 3 strategies and 3 tactics – that will determine India’s next Prime Minister. 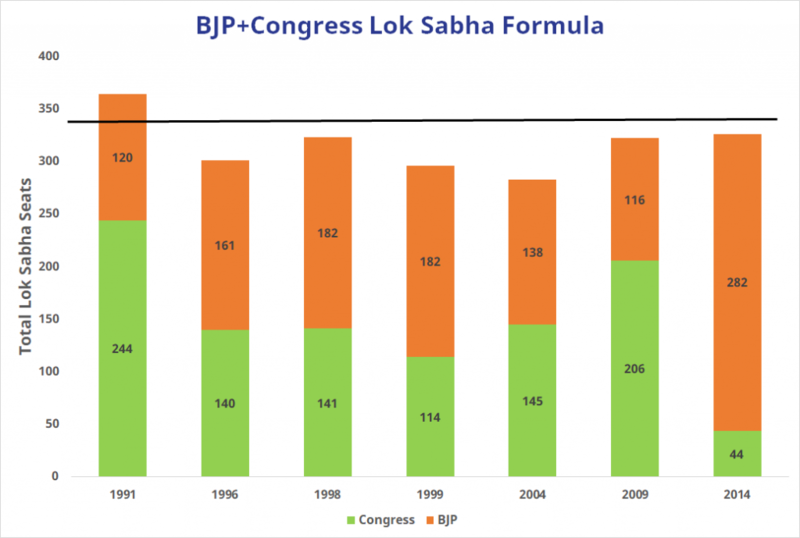 This is what the BJP and Congress win together in the 543-seat Lok Sabha, as you can see in the table which shows the story of elections since 1991. The rest go to regional parties who may or not be allied with either of the two national parties. Thus, the most important contests are where the BJP and Congress fight directly against each other. Each seat outcome results in a relative difference of two between them. For Narendra Modi to continue as India’s PM, he would like to ensure that BJP’s 282 tally should not fall below 230, which means Congress less than 100. For Rahul Gandhi to make an attempt to become PM, he will need to at least ensure Congress’s 44 seats go up to more than 130, which means BJP less than 200. So, BJP + Congress is 330, BJP’s target is 230+, and Congress’ target is 130+. 10 crore is the number of unregistered voters in India. 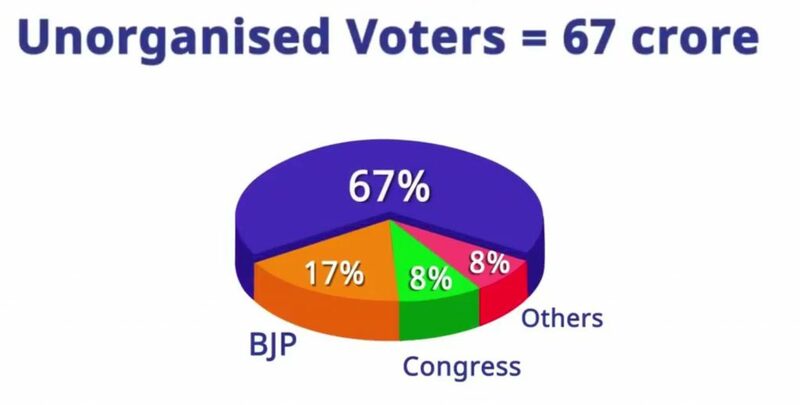 Of these, 7.5 crore are in the 18-24 year age group, while the other 2.5 crore are older voters who have not registered of a variety of reasons. 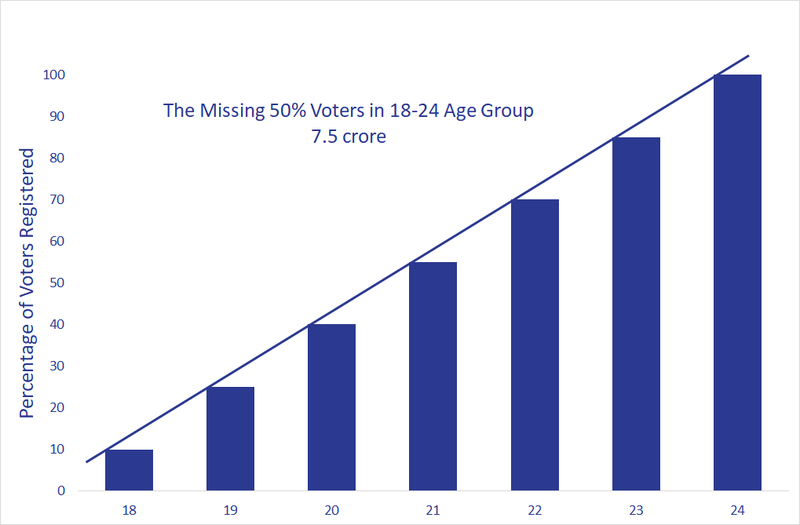 As you can see in the graphic, half of all 18-24 year-olds in India are not on the electoral rolls. This number comes to 7.5 crore. These 10 crore missing voters are part of the 33 crore Indians who do not vote. Another 34 crore are undecided or not likely to support one of the mainstream parties. Together, they number 67 crore – two-thirds of the eligible voters in India. And they are up for grabs. This is 4 times BJP’s core support base and 8 times the core Congress support. The total number of seats in the two large states with four strong parties – Uttar Pradesh with 80 and Maharashtra with 48 states. BJP won a total of 94 seats and its allies won another 20, making a total of 114 of 128 seats. With BJP as the party to beat, the number of candidates against the BJP will determine its success in the next election. More the candidates from the main parties, the better will be tis chances. So, the key to the next election lies in the index of opposition unity in these 128 seats. A wave election, like 2014, is needed to ensure a national mandate. Else, elections tend to be an aggregation of state elections which tend to lead to fractured mandates. There have only been 3 wave elections in the past 40 years – 1977 (after the Emergency, which brought the Janata party to power), 1984 (after Indira Gandhi’s assassination, when Rajiv Gandhi’s Congress swept the nation) and 2014 (where Narendra Modi’s BJP became the first party in 30 years to win a majority). Parties like waves – it unites voters to create a winning majority. Will the next election be a national wave or states summation? To create a wave, the election has to be about 1-2 big ideas. No one really bothers with manifestos anymore. Which will the big ideas in this election? Congress’ record in government in the 60 years starting in 1947? BJP’s track record in delivering acche din since 2014? Corruption? Governance? Narendra Modi himself? To sell its big idea, a party only targets a selected set of voters – those who they think will support them. So, it is not about the Electorate, but about the Selectorate. This is the minimal mix of smaller groups that is needed for a party to craft a win in a first-past-the-post system where the party getting the highest number of votes wins. BJP’s selectorate was the aspiration middle class for a long time, but it now seems to be transitioning that to the poor. Elections are about divide-and-rule. Like in a marketplace, politicians and their parties like to have voters see sharp differentiation to ensure they turn out to vote. Hence, the need for polarisation. Caste, community, class – all can divide the electorate and therefore unite the selectorate. In the absence of optimism, a party will use anger, fear, high passion to maximise voter turnout in its support base. India has 10 lakh polling booths, each with about 1000 voters, which comes to about 250 families. In every election, what matters besides the top-down media campaign is the ground game, especially closer to the voting day. Using data and analytics to identify supporters and then getting them out to vote on election day will be instrumental in determining the eventual winner. To make this happen, parties need the sales army – the booth workers who can register new voters, persuade the supporters and undecideds, and then turn them out to vote. The one big change from 2014 is the amazing growth of smartphones and data connectivity across India. As a result, Facebook and WhatsApp have become the primary methods for sharing content and opinions. You see the explosion of creative content every time a big news story breaks. More than half of all voters, and at least one person in every household in India is now digitally connected via a smartphone. Digital India may take time, but India’s Digital Election is coming! So, these are the numbers, strategies and tactics that will decide who will be India’s next Prime Minister. What happens in the elections will determine our individual and collective future – more than at any time before. India is a young nation. We have lost a lot of time over the past decades in pursuing policies that keep taking us away from the path to prosperity. This election offers yet another change moment. Be aware of the games the politicians and their parties play, and vote wisely – for India’s First Prosperity Prime Minister.